Flame retardants are the chemicals used in the combustible products in order to make them resistant to flames and to reduce the combustion time and slow down the spread of fire to other materials. The developing environment with increasing manufacturing, construction, and transportation industry tends to highly impact the demand for flame retardant products. China and India are one of the top countries that are engaged in the development of such industries. The construction industry and automobile industry accounted for the highest demand of flame retardant products. Further, there is a trend of using bio-based flame retardant chemicals on the backdrop of rising environmental and health concerns from the use of other chemicals such as brominated flame retardants. Goldstein Research analyst forecast that the global flame retardant chemicals market is set to reach nearly USD 15.6 billion by 2024, growing at a CAGR of 6.8% over the forecast period (2017-2025). Alumina trihydrate (ATH) accounted for the largest market share of 29.4% in 2017 on the back of inclination towards non-halogenated chemicals and it is expected to grow at a CAGR of 7.0% over the forecast period. Based on geography, Asia-Pacific region accounted for the largest market share of nearly 40.1% in 2017 due to high demand for flame retardant materials from multiple growing sectors such as the construction sector and plastics industry. APAC is followed by North America and Europe, growing at a CAGR of 6.9% over the forecast period. The report covers the present ground scenario and the future growth prospects of the flame retardant chemicals market for 2017-2025 along with the market players’ analysis. We calculated the market size and revenue share on the basis of revenue generated from major players in the Global region. Global Flame Retardant Chemicals Market Outlook 2017-2025, has been prepared based on an in-depth market analysis from farm market experts. 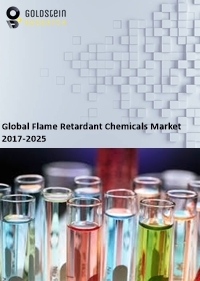 The report covers the competitive landscape and current position of major players in the Global flame retardant chemicals market space. The report also includes Porter's five force model, SWOT analysis, company profiling, business strategies of market players and their business models. “Global Flame Retardant Chemicals Market Report” also recognizes value chain analysis to understand the cost differentiation, pricing models to provide a competitive advantage to the existing and new entry players. Our global flame retardant chemicals market report comprises of the following companies as the key players: Albemarle, ICL, Clariant, Lanxess, Nabaltec, The Dow Chemical Company, BASF, Akzo Nobel, Italmatch, Huber Engineered Materials, etc.